THIS PARKING OPERATION MANAGEMENT AGREEMENT (this "Agreement") is entered into as of ________________, by and between the persons identified as "Owner" on the signature page to this Agreement ("Owner"), and ________________________., a _______________ corporation ("Contractor"). 1. Scope of Engagement. 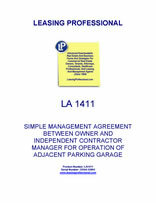 Owner hereby engages Contractor to provide professional parking management of the parking garages and/or areas at the premises described on Exhibit A to this Agreement (the "Managed Premises"). 2. Term. The term of this Agreement shall begin on the date hereof and, unless sooner terminated as herein provided, shall end on that date which is thirty (30) days following written notice of termination given by either Owner or Contractor to the other. This Agreement may be terminated with respect to less than all of the properties comprising the Managed Premises. 3. Independent Contractor. Contractor shall perform all of the services as an independent contractor and not as an agent of Owner. Owner shall reserve the right to instruct Contractor in writing through Contractor's agent or supervisor regarding the extent of the services and the results to be accomplished thereby; provided, however, Contractor shall have sole control, supervision, direction, and responsibility over its employees and the manner of providing the services. Except as set forth in this Agreement, Contractor shall have no authority to take any action on behalf of Owner without the express written consent of Owner. (a) The Managed Premises are primarily for the convenient use and benefit of tenants and guests of the adjacent building(s) and will at all times be available to building tenants and guests(during the hours of operation) subject to Owner's right to designate special usage from time to time. (b) The Managed Premises will be operated in a manner consistent with that of first-class garages and/or areas in the area in which the Managed Premises are located. Accordingly, Contractor will staff the operation with good, experienced, professional management. Contractor will operate the Managed Premises efficiently and properly through proper utilization of space, manpower and direction. (c) The Managed Premises will be open for parking as directed by Owner. (d) The Managed Premises will be maintained in a neat and clean condition, and will comply with all city, state and federal laws, rules or regulations, including, without limitation, any regulations or guidelines adopted for operation of the Managed Premises by Owner. (e) Contractor will issue permits to only those tenants designated by Owner and collect parking fees from those tenants in a manner directed by and acceptable to Owner. (f) Contractor will make recommendations, subject to Owner's approval, for operation of the Managed Premises including a system of tags, tickets or other methods best designed to indicate the number of vehicles using the Managed Premises and recommend parking rates for the Managed Premises. (g) All rates will be subject to the prior approval of Owner. (h) No signs will be erected in or about the Managed Premises without prior approval of Owner. (i) Contractor shall purchase on behalf of Owner all federal, state, and local licenses required by law to be obtained for the operation of the Managed Premises. (j) Contractor shall supervise the proper and efficient parking in the Managed Premises of the cars of members of the general public; collect parking fees from such transient parkers in accordance with rates and policies as established by Owner; issue, collect and keep safe all parking tickets received from such transient parkers; and prepare and maintain accurate reports and records on a daily basis of all such transient parking operations. In this connection, Contractor acknowledges that the primary intent for use of the Managed Premises is to serve employees, patrons, and visitors of the buildings. (k) Contractor shall supervise and control continuous daily policing of the Managed Premises and equipment; establish controls to prevent vandalism, theft, arson, damage to parked cars, and to the Managed Premises and equipment; maintain the Managed Premises as required to prevent unreasonable accumulation of debris, dust, oil, dirt, slicks, and loss of security. (l) Prior to September 1st of each year, Contractor will provide Owner a budget for the ensuing year in a form reasonably satisfactory to Owner. (m) Contractor shall comply with all applicable city, county, state, and federal laws and regulations and obtain all necessary licenses, bonds and permits applicable for the Managed Premises. (i) On-The-Job Payroll Costs. All wages and salaries for on-site personnel employed by Contractor to fulfill its obligations under this Agreement. (ii) Payroll Taxes and Other Direct Costs. All payroll taxes, whether federal, state, or local. (iii) Cost of Materials, Supplies and Equipment. The actual cost of materials, supplies, and equipment used by Contractor in the performance of duties hereunder; provided, however, that, any materials and supplies or equipment so purchased shall be mutually agreed upon by Owner and Contractor prior to such purchase. (iv) Other Items. Contractor shall contract for and purchase on authorization of Owner and at Owner's expense any other services and commodities necessary in the operation and maintenance of the Managed Premises, as well as for the making of all repairs, alterations, and decorations with respect thereto, including, without limitation, sweeping of the Managed Premises and gutters of the adjacent streets weekly; provided, however, that Contractor shall not contract for any repair or alteration, without the prior approval of Owner. (b) Payments to Contractor. As full and complete payment for services provided by Contractor under this Agreement, Owner will pay Contractor a monthly management fee of three percent (3%) of gross parking receipts for such month. (c) Payments. Payments of the charges of all items listed in this Section 5, and all disbursements which are required under this Agreement, including the compensation of Contractor herein set forth, shall be made by Owner to Contractor within fifteen (15) days after the end of the month or upon receipt or the bill of expense as submitted by Contractor, whichever is later.